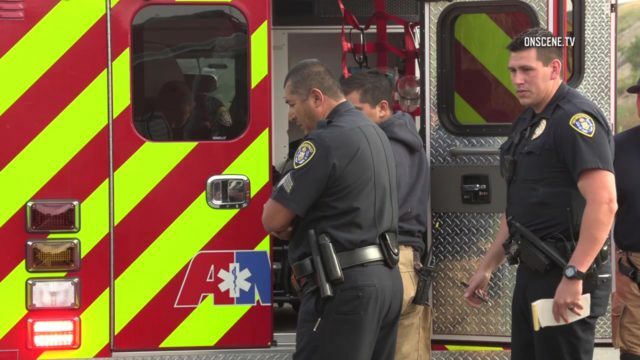 An injured woman was found lying on a roadside embankment near the Otay River Friday, hours after being hit by a hit-and-run vehicle. Photo via OnScene.TV. An injured woman was found lying on a roadside embankment near the Otay River Friday, hours after being hit by a hit-and-run vehicle. A passerby spotted the woman in the 300 block of Hollister Street in the Palm City district of southern San Diego about 7 a.m., according to SDPD public affairs Officer Joshua Hodge. The victim was conscious when officers arrived, and told them she had been struck at about 2 a.m. and had been unable to move from the slope where she had come to rest. Medics took the woman to a hospital for treatment of broken bones, abrasions and a possible bruised lung, according to Hodge. Her injuries were not considered life-threatening, the spokesman said. But she could not provide any description of the vehicle that hit her, Hodge said.